While travelling through Europe you will find Rome to be one of the most popular tourist destinations due to its historical and architectural beauty. It is extremely important to be aware of the different locations and to plan your trip accordingly to make sure you do not miss any of these special spots and to amuse yourself with their enchanting legends. One of these sites is called the Trevi Fountain. 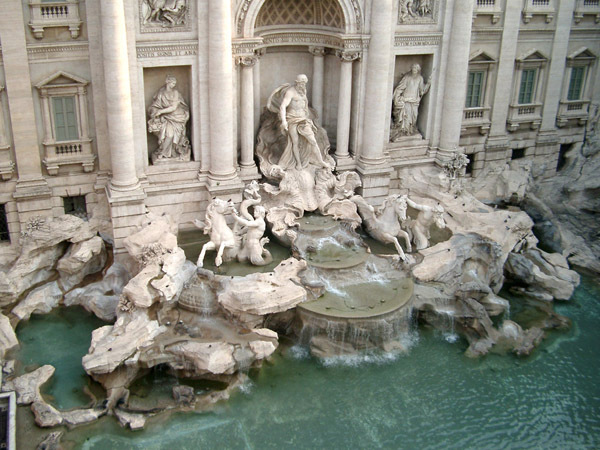 History has it that this was a project where Pope Urban VIII envisioned the watering system of most of Rome to flow into a fountain which was to be created at the Trevi Square in the middle of Rome. However, the project got postponed due to his death, and instead it got completed by Pope Clement in 1732. The Trevi fountain of Rome was created by the famous architect Nicola Salvi and it is considered to be one of the greatest masterpieces of architectural beauty in the whole of Rome. It is a construction which allows the waters of Salone springs which are about 40 kms away from Rome to supply water to the whole of Rome. Some of the characteristics of the Trevi fountain include the large figure of the God of the sea or Neptune who is riding a chariot being pulled by two horses and which is in a shape of as shell. The two horses represent the calmness and the restlessness of the sea. The actual base of the fountain is lower, and therefore you need to go down to reach the water. People are advised to see the fountain in the night and it is extremely important to note that once you come close to this wonderful display of architectural beauty and style which has stood for so many hundreds of years alive and vibrant, you will soon forget that you are in the middle of such a busy and modern city as Rome. There are many legends attached to this wonderful place and one of them is that if you throw a coin in the fountain which is considered to be the bottom of the sea you will definitely have the opportunity to go back to Rome. There are other legends that proclaim that you will have a wonderful marriage or that you will have good luck if you throw three coins but whether people believe these or not you will find that there is a very large number of coins being thrown in the Trevi fountain every day by devoted people and tourists who look forward to being able to visit Rome once again. These coins are collected at night and they get used to feed the poor people. A visit to Rome would be incomplete if you don’t see the Trevi Fountain. Want to see the beautiful Trevi fountain of Rome for yourself? Check out the 160+ apartments in Rome available for short-term rent. Lovely Rome apartments available near most major tourist attractions. Great prices – up to 51% cheaper than Rome Hotels. Rome is a good place to travel.it is the most sacred place for the Christian.Its is famous for its wonderful scriptures and design palaces.Thanks for the post..